Anno was Okazaki's assistant and protegee before she began her own career; they both have a certain sharp strong line and a focus on girl-on-girl violence and cultural policing. 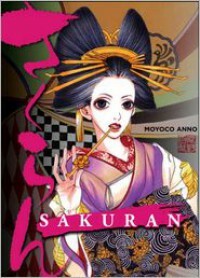 Like Helter Skelter, Sakuran is a single-volume story focused on the career of a strong-minded, vicious-tempered woman who is abusive to the people around her and who yet has some appeal, or at least fascination, because of her ferocious determination to survive. Kiyoha is a prostitute in the Yoshiwara in the Edo era, which means that she was brought into the quarter by a man who sold her to a brothel and she will not leave unless and until she marries; gates lock the prostitutes into the district. This doesn't stop Kiyoha from attempting to escape. Difficult to follow because you don't most of the usual hair and costume cues to differentiate characters, and because the narrative is not chronological; it's more rewarding on rereading, but like all of Anno's work that I've read, it's loosely structured. This surprised me in a single volume more than it does in an open-ended series, and I was also comparing it to the tight focus of Helter Skelter. I still want way more Moyoco Anno in English.